If I'm guilty of cultural appropriation, then it will be towards the Irish. From Belfast to Cork, I love the place and all its traditions. One such tradition is the coming together and celebrating of St. Patrick and his day. People across the world enjoy joining in with the celebrations and I love the feeling of connectivity that comes with the 17th March (let's face it, we're all a bit Irish in some way). 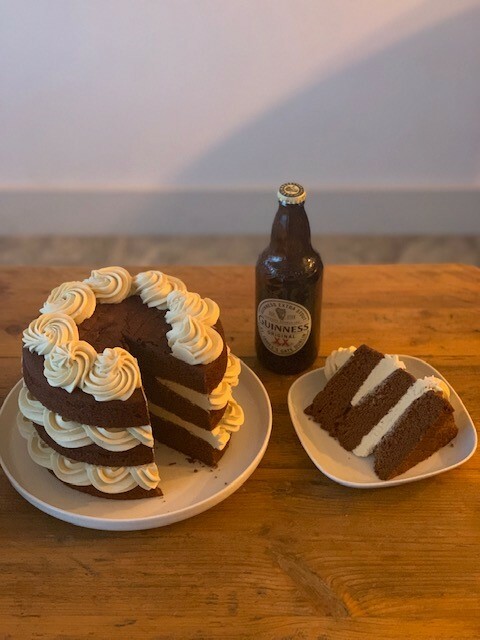 I came up with this recipe to celebrate this day and the two iconic drinks that hail from the emerald isle - unmistakably Guinness and Baileys. The rich and malty chocolate cake pairs beautifully with the sweet custardy frosting, laced with that beautiful liqueur. Sugar - You'll notice the two types of sugar I use are caster and light brown. This is done on purpose to achieve the perfect balance of sweetness with caramel notes. If you only have one or the other, then please use you what you have. I did find that dark brown sugar overpowered all other flavours. Chocolate - I use cocoa and melted chocolate in this recipe for extra antioxidants (I know, who am I kidding). If you do want to use melted chocolate, then I would recommend a high quality bar with a minimum of 70% cocoa solids. If you don't want to use chocolate as well as cocoa, then just leave it out and increase the cocoa to 100g. Yogurt - The addition of yogurt is to keep the cake moist for days to come, if it even lasts that long. You can always use buttermilk or sour cream for the same effect. Frosting - You'll notice the rather intricate and somewhat labour intensive frosting recipe I've provided! This is on purpose and I would highly recommend going all out to achieve this beautiful frosting that is like eating clouds. However, I try to stay in the real world and I know that not everyone has the time, patience or energy to spend an hour on frosting. 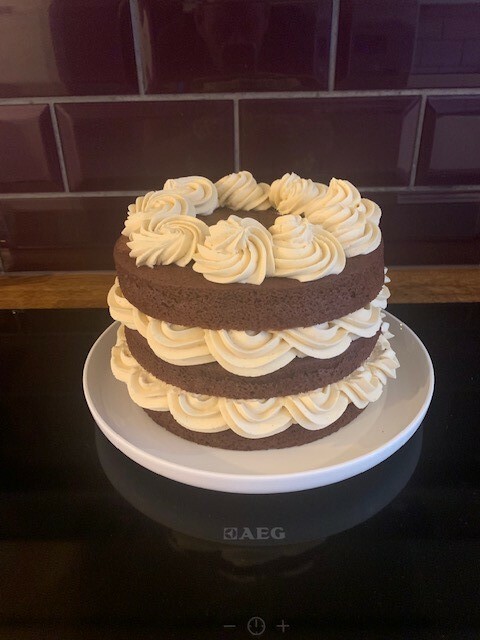 If this is the case, then you can achieve an equally beautiful buttercream with 250g unsalted butter, 300g icing sugar, 1tsp vanilla bean paste and 3-4 tbsp Baileys. Whip these together in a stand mixer or with a hand mixer and slather over the cooled sponges. Nutmeg - This might raise a few eyebrows, but it's my own nod to the Jamaican Guinness Punch which mixes condensed milk, Guinness, nutmeg and sometimes cinnamon. I'm a fan and I would highly recommend trying it, but feel free to leave out the nutmeg if you don't want it or have it. Grease and line 2-3 8” round cake tins and pre-heat the oven to 180°c / 350°f. In a saucepan over a medium heat, melt the butter and chocolate, stirring occasionally. Remove from the heat and stir in the Guinness, yogurt, vanilla and then the eggs – set aside. In a large bowl (or food processor) thoroughly combine the flour, baking powder, cocoa and sugars. Stir through the wet chocolate and Guinness mix, ensuring the mix is smooth with no lumps. Divide the batter equally between your tins and bake in the centre of the oven for 35-45 minutes, or until a skewer comes out clean when inserted in the centre of the cake. Please monitor your cakes after 25 minutes as all ovens differ to mine and these cakes can easily under or over bake. Allow the cakes to cool in their tins for 10 minutes before turning them out onto a cooling rack and cooling to room temperature. Soak the gelatin leaves in cold water for 5 minutes. In a saucepan mix together the cornflour, sugar, vanilla bean paste, egg yolks and cream. Cook this over a medium heat for up to 10 minutes (possibly more), stirring continuously with a whisk. The mixture will thicken and take on the consistency of cold custard from a carton; once you’re at this stage, remove the pan from the heat, strain the gelatin and stir this through the custard. Stir through the Baileys and then cover the mix with cling film and allow to cool to room temperature. I transfer the mix to a shallow casserole dish, so it cools more quickly. In a bowl (or stand mixer) whisk the room temperature butter until soft and fluffy and incorporate half of the icing sugar. Add the custard to the buttercream in 3 stages, ensuring it is fully combined. At this stage the mix will be wet and runny, so refrigerate until it is completely fridge cold. Once cold, whisk again on high until the mix thickens and takes on a thick and creamy texture. Taste the mix as you go for sweetness and add more icing sugar if necessary. This process can take some time, but keep cooling and whipping the frosting until you have a thick and creamy consistency. Lastly, whisk through some freshly grated nutmeg and do so to taste. Stack your cakes with the thick and rich frosting and flurry with a final dusting of nutmeg and grated chocolate for that extra little finish – enjoy! You've been watching that bunch of bananas slowly turn brown for days now and you have absolutely no intention of eating them, so what do you do?! You make banana cake (bread) of course! Now, I have friends who are frivolous enough to buy a new car every year, but would never in a million years throw away an old banana! The idea seems preposterous and I couldn't agree more. Once again, I don't just make a simple, low fat cake, but then I think you'd all be upset if I didn't put some calorific twist on my recipe. Bananas Foster is an incredibly simple, yet delicious dessert that hails from 1950's New Orleans. Typically, bananas were cooked in sugar, butter, cinnamon and then flambeed in rum before being served over vanilla ice cream. 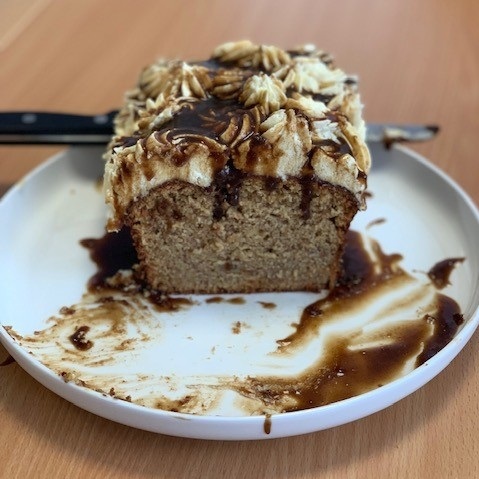 The result was a beautiful mix of warm spice, with caramel and bananas with a creamy twist - perfection! I wanted to bring these incredible flavours together in a cake, and the result is below! Just a few notes before we get started. Bananas. I mentioned that bananas that are on the turn work best, and I do stand by that. However, because you pre-cook the bananas, you can also get away with slightly newer fruit and even some that may still have a green tinge. Dark rum only please - I tried white rum and it was disgusting! Spices. Traditionally, cinnamon was used in the dessert and that was it. I like the warmth of nutmeg as well, but you can omit both, or add more spices - what about ginger? Light brown sugar in the main body of the cake is a personal preference, but you can use white sugar if you like. I tried dark brown sugar, but I found the flavour very rich and the sponge a little too dense for my liking. The frosting! I wanted to recreate the taste of vanilla ice cream in a frosting (buttercream) and this was as close as I could get it. Technically you would make a custard when making ice cream, so it seemed a natural starting block. The addition of gelatine seems odd, but it's the right amount to keep it sturdy enough to hold its own, without having a rubbery texture. If you can only get hold of powdered gelatine, then the equivalent weight is 6g or half a sachet. This is a large quantity of frosting, but believe me it works well on so may other things that you won't mind having some spare. Grease and line a standard 2lb loaf tin and pre-heat the oven to 180°c. In a large frying pan (or saucepan) over a medium heat, melt the butter, dark brown sugar and cinnamon until they turn to a bubbly syrup. Peel the bananas and cut up however you want (discs or strips). Add these to the pan and cook for 2-3 minutes, turning halfway through. Add the rum and cook for a further minute – it’s not necessary to flambé the rum, but you can do so if you don’t value your eyebrows! Use a slotted spoon to remove the bananas and add these to a bowl along with the butter – reserve the cooking syrup. Mash everything together to melt the butter and to cool the bananas, before adding the eggs and beating together. Weigh out all the dry ingredients into a large bowl and use a whisk to combine them. Pour in the wet ingredients and use the whisk (or spoon) to combine everything, without over mixing. Pour this into the prepared tin and cook in the middle of the oven for anything from 45 minutes to 1 hour (my oven takes 50 minutes). Apologies for the vague times, but each oven differs. A skewer will come out clean once the cake is done. Set aside to cool in the tin for 10 minutes before turning out on to a rack to cool completely. Because of the long cooking time, I find that the outside can have a decent crust, so I wrap mine in cling overnight and use it the next day to make everything a bit softer. In a small saucepan, mix together the cornflour, salt, sugar, vanilla bean paste and egg yolks. Add the milk and place the pan on a medium heat. Bloom the gelatine in cold water whilst the custard is cooking. whisk the custard gently over the heat for 5-10 minutes until it is thick and silky. It may appear lumpy at one point but keep going with the whisk and you will end up with a thick and delicious custard. Squeeze the water from the gelatine, add it to the pan and return to the heat for a further minute, stirring continuously. Remove the custard from the heat and allow to cool to room temperature. Whisk together the butter and icing sugar until pale a fluffy. Add the cooled custard (it will be a solid lump) and whisk together until everything has combined and is nice and thick – an electric whisk or stand mixer is recommended for this. Pipe the frosting over the cooled cake however you like, or you can just smear it on with a palette knife. Pour the cooled syrup over the top and serve. Note: you can serve this warm as a dessert with the frosting (or actual ice cream) and syrup as sides.